At the end of the day, when I’m changing clothes and getting ready for bed, one thing that I always do is examine the shirt and pants I’ve just removed. I look them over for obvious signs of dirt or stains or other indications that a cleaning is in order. I give the items a careful smell test to make sure no odor has accumulated on them (I usually do this the next day to give my sense of smell a chance to acclimate). If they pass those tests, I’ll take the item, fold it up, and put it back into my drawers or into my closet. I don’t wash my clothes after every wearing. If they’re still reasonably clean, I see no reason to waste the water or energy to wash them again. Most of the time, my clothes simply don’t get dirty during the period in which I wear them. Sure, they get dirty if I spend a day playing actively with my kids or doing some grimy work or exercising, but on most days I don’t do those things, so they don’t get very dirty at all. If your clothes aren’t dirty, then washing them is an unnecessary expense and an unnecessary use of your time. If you can save yourself a load of laundry every two weeks by simply not washing clothes that aren’t dirty, then you’re not spending the time to load and run the washer and dryer and you’re not paying for the energy and water needed to run those devices. There’s also the factor that each washing adds unnecessary wear and tear to your clothes. A trip through the washer is far harder on your clothes than a typical day of wear, meaning that washing them every time reduces the lifespan of your clothes and adds to your clothes budget for the year. Some people develop elaborate systems for this. I have one friend who has designated drawers for clothes that have already been worn once. If he wears an item out of these drawers, he leaves that drawer open, then when he changes clothes at night, if he spies that drawer as being open, he adds that item of clothing to the laundry. Another friend uses a laundry basket in his bedroom for items that have been worn but aren’t really in need of washing. He tends to save those clothes for more casual days, when he’s working from home or just spending a day running normal errands. I do things in a much simpler fashion. 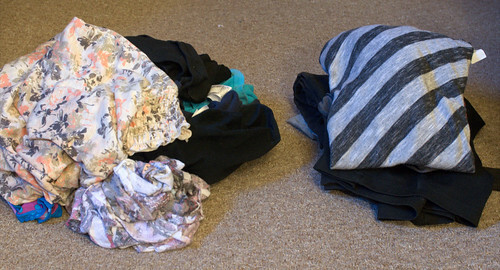 All of my clothes are either “fit for wearing” or “need washed.” If it’s fit for wearing, I make no distinctions about how recently it’s been washed. It’s already either been washed or examined, so I’m sure it’s fine. Obviously, everyone is going to have their own definition of “dirty.” For some people, wearing a shirt for half a day is enough to make them want to scrub it clean. For others, they will re-wear clothes until the odor is overwhelming. There’s a happy medium in the middle there, one that balances cleanliness, time, and money. The challenge is finding your own balance. If you’ve got clothes that simply aren’t dirty, don’t wash them just because you’ve worn them once. It’s hard on your clothes, hard on your time, and hard on your wallet.